Edward Kerr, MD is a neurosurgeon whose professional interests span a wide range of brain and spine surgery with a focus on minimally invasive approaches to lesions of the skull base. He graduated with honors from Duke University and attended Baylor College of Medicine in Houston, Texas. He subsequently completed his internship and residency at the University of California (UC) Davis Medical Center in Sacramento, California. 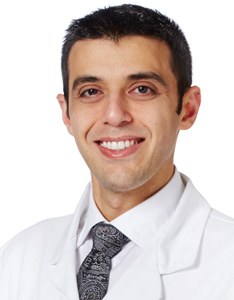 His interest in all forms of neurosurgical care led him to complete two fellowships: complex spine surgery at UC Davis and minimally invasive cranial base surgery at Ohio State University, where he trained with pioneers in the area of endoscopic endonasal skull base surgery. Dr. Kerr’s productivity in research during his training earned him the Excellence in Clinical Research Resident Award from the UC Davis Department of Neurosurgery. He has authored numerous peer-review articles, book chapters, and abstracts/poster presentations. Dr. Kerr has served as associate faculty at the Ohio State University state-of-the-art endoscopic skull base surgery course. In his spare time he enjoys traveling, skiing, staying active, and being with friends and family. Read More About Edward Kerr, M.D.